This week’s progress has been mediocre. The RPW2016 challenge took more time than was expected. The completed chart. I am going to Chennai, India tomorrow for two weeks. For the past few times these trips have been stitch free. Hoping for some embroidery productive days. 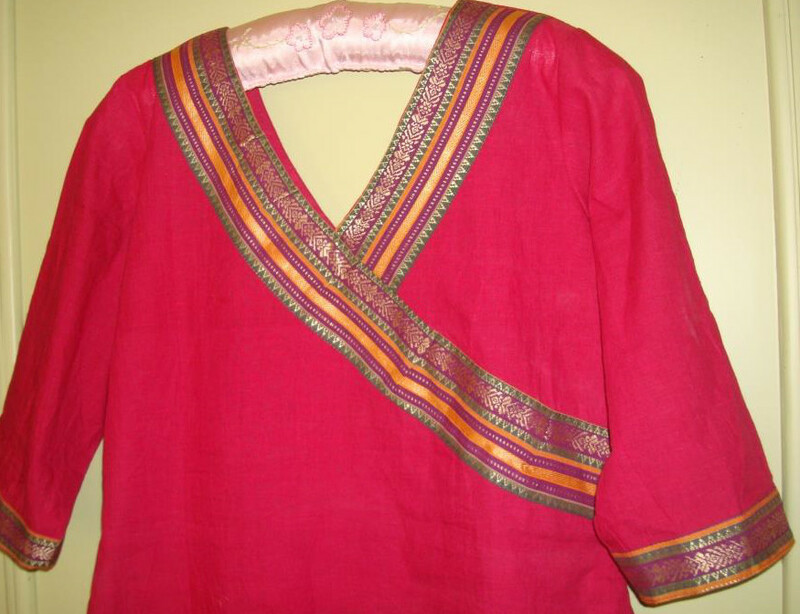 The tunic fabric was marked for neck and sleeves by the tailor. The pattern was drawn on the sleeves first. In this transfer also, the fabric to be marked is placed over the design and the pattern is drawn with a pencil. 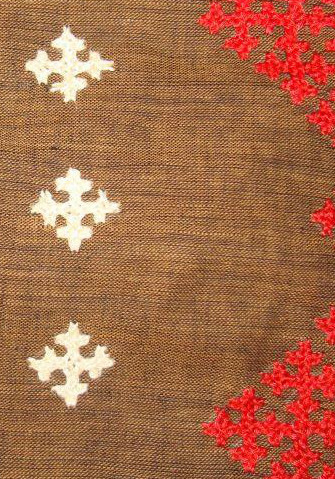 The kutchwork/ interlacing stitch/ marash embroidery commenced with the brown thread. Same colour as the brown fabric. The impact of working this kutchwork, the multi colour mirror work on white and blue combo tunic and seeing a kasuti embroidery design – all gave rise to another idea of working kutchwork embroidery in four colours on an orange and violet tunic. I am still in the process of drawing the pattern. The embroidery will be three places- the sleeves, below the neck and a big design on the right hand side of the tunic. I may have more details after the designs are completed. The mirror work around the neck and sleeves on this blue white combo tunic was completed. After working the sleeves with brown thread, I proceeded with the work on tunic front. The spaces inside the squares will have the mirrors. 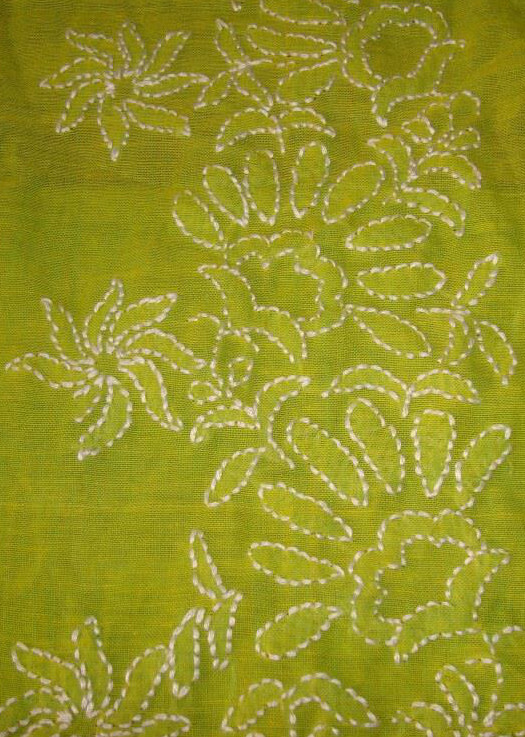 The kantha embroidery is drawn and ready to be transferred. With the packing in progress for the trip, If time permits, the tracing can be made on the plain black fabric to be worked in Chennai. Will have to wait and see. This week’s chart RPW2016 challenge is another alphabet. The chart is available on their blog. Three things are different this week. 1. I have nor completed this week’s chart. Still working on it. Hoping to complete tomorrow. 2. Instead of leaving a space of four square from the earlier row, the space is for two squares only. I started the work from the centre this time. While working on the letter ‘E found the rows to be too close. Checking of the chart revealed this mistake and also threw light on how it started. After two hours of working, did not have the mind to rectify the mistake. 3. An extra stitch widened the letter ‘C’. Not planning to go back on this either, will just adjust the space accordingly before working ‘B’. Even while working the chart on the same day it is published did not have so much explanation or mistakes. Older and wiser! It is hard to believe this is the 100th post in this topic. It started with linking the posts of works in progress to Pintangle, where SharonB was posting every Wednesday, her works in progress. When Sharon wanted to make some changes on her blog, this category disappeared. There was no reason not to continue sharing my works in progress, these weekly reports are motivating. It has also become an habit. The randje per week 2016 challenge had a the mirror image of the last week’s border, which was completed on Saturday. 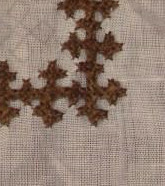 The first phase of working kutchwork embroidery on brown fabric was completed with the fifth motif. The cream tunic fabric along with this embroidered piece and the kalamkari fabric is with the tailor now for marking the front and sleeves. He has to mark keeping in mind the placement of these two- embroidered brown piece and kalamkari fabric. The blue and white combo is getting full attention now. The mirrors are being stitched in different colours of thread. 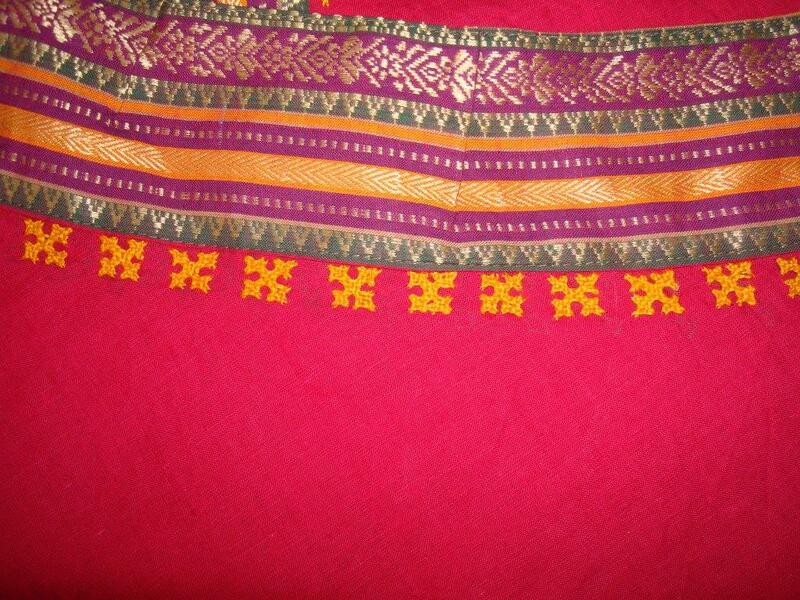 After tracing the design on the beige tunic, the embroidery started with brown colour thread. The kutchwork border work grew a little bit this week. this project may take a back seat for a while. 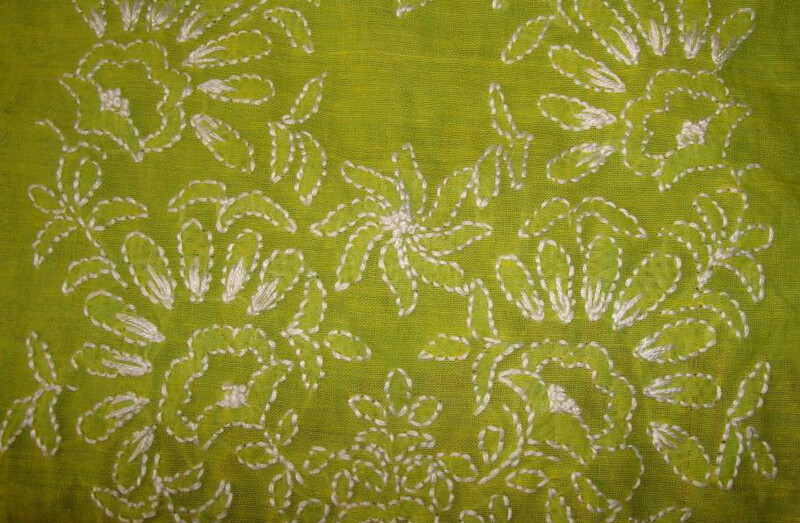 A design to work kantha embroidery on sleeves was chosen this week. 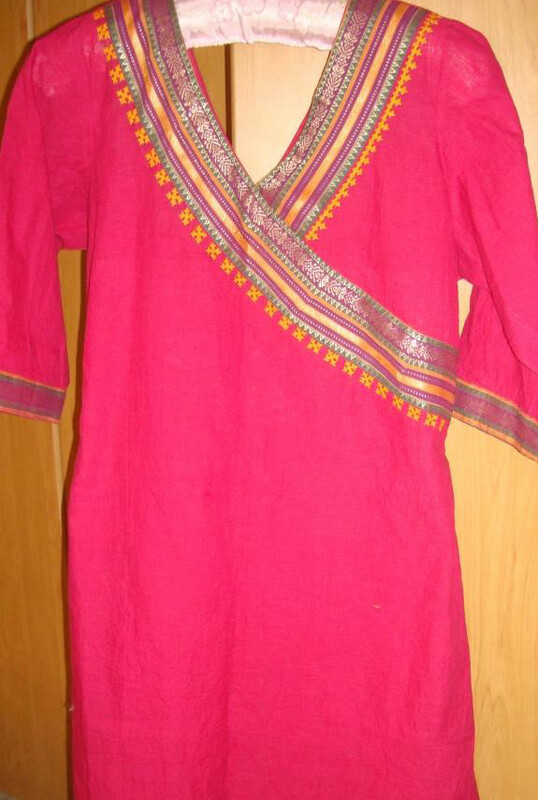 This tunic fabric is cotton. It might be Kanchi or south Indian cotton. It came with a woven border on it. The embroidery is worked after the tunic is sewn. 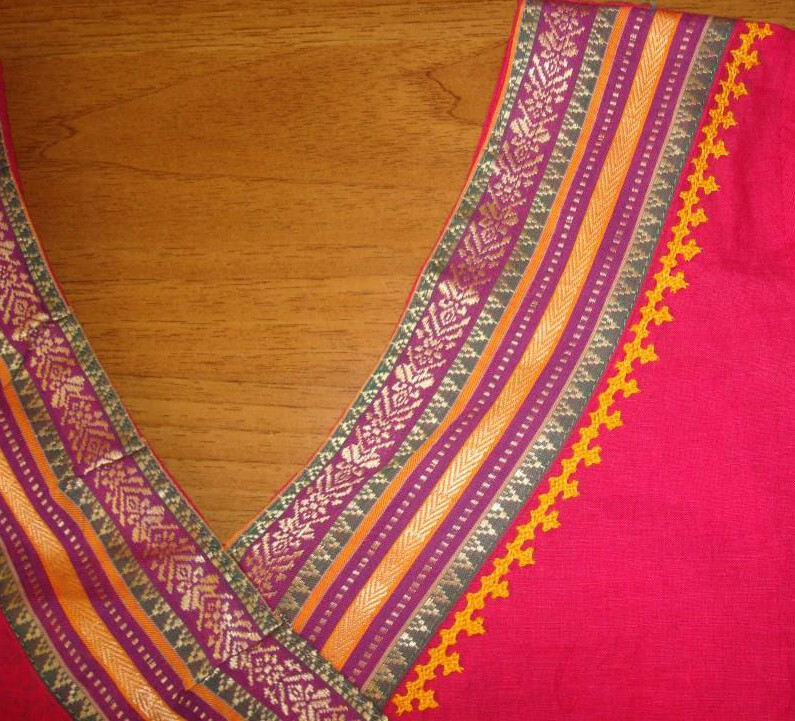 The tailor stitched the border on the tunic beautifully and neatly. 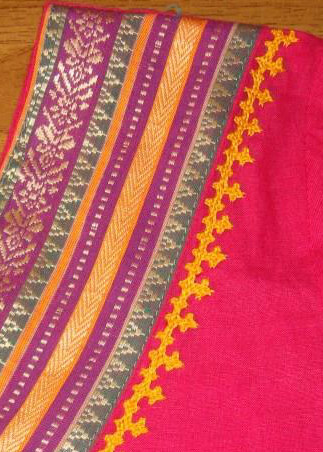 The idea was to work kutchwork borders just below the borders in the front of tunic and use mirrors to further embellish it. Presently the designs I am working on are exclusively kutchwork, without any other stitches, influenced by Armenian Marash embroidery. The small kutchwork borders were drawn free hand with pencil. 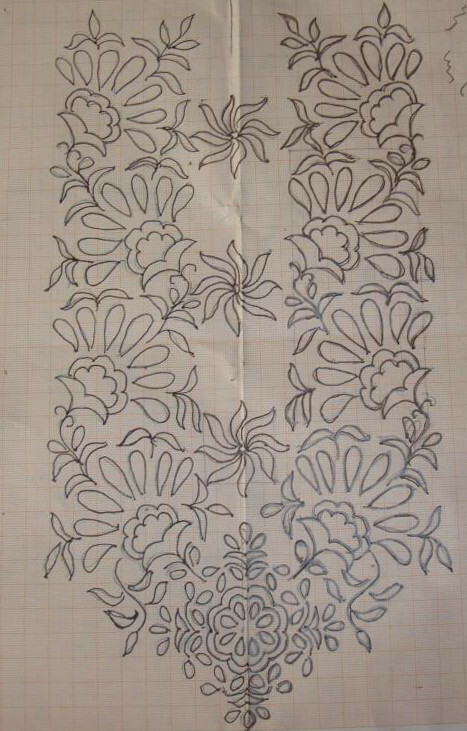 When I started embroidering on the tunics, this is how the designs were drawn on sewn tunics. 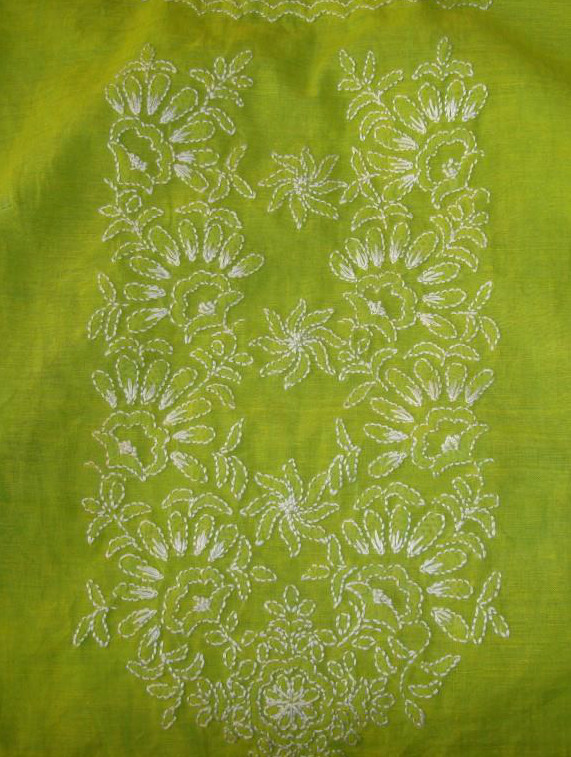 Going down the memory lane, the kutchwork embroidery was worked with yellow anchor cotton skein# 304. The completed second border. When looking at these two borders, I felt the embroidered borders were quite attractive below the woven borders by themselves, and if the mirrors are stitched, they might take the focus away from the beauty of the woven border. 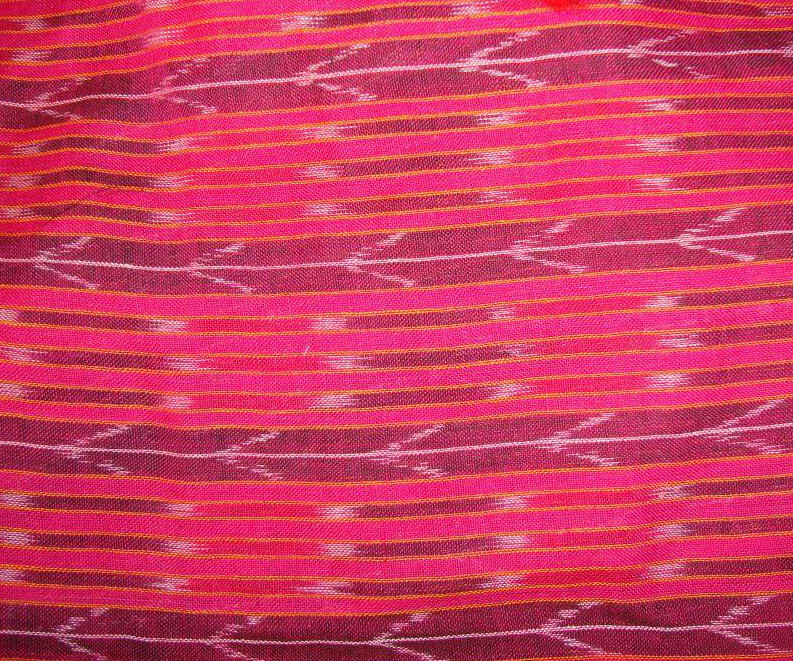 While buying this fabric, I could get a cotton ikat with similar colour scheme of the woven border for matching salwar [Indian pants]. Since the patterns were drawn on the tunic itself, the pattern on paper is not available for sharing. Nothing surprising about this week’s chart on RPW2016 cross stitch challenge. The mirror image of last week’s border is worked on the other side of the letter ’Z’. The chart is here. It took 2 .5 hours to work this border. It also made me think, may be it is possible to work a border of this area for any other purpose also – tunic sleeve, book mark, card, collar, cell phone cover, needle book -in a day’s work. That’s an eye opener. I have written this down on this post before this theory slips away. The Randje per week 2016 sampler chart has a border with letter ’Z’. It was completed on Saturday. 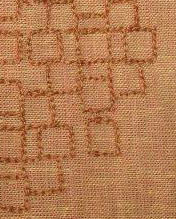 After working another motif on this project, some simple kutchwork squares were worked in cream thread. The kutchwork borders were worked during the week. And decision was made not to add any embellishments on this project. Today I have started stitching the mirrors around the neck of the blue/ white block printed tunic. Yet to take the picture. It is quite hard to push and pull the needle through the 1 inch border. The beige tunic was picked up with markings. The working on the embroidery will start after tracing the design. This project is in the designing stage. 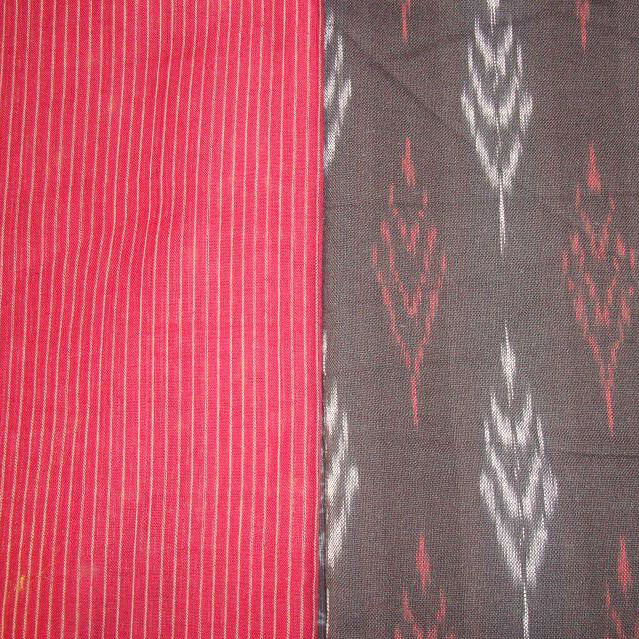 The fabrics are maroon striped mangalagiri cotton and ikat cotton. The tunic is the combination of these two fabrics. 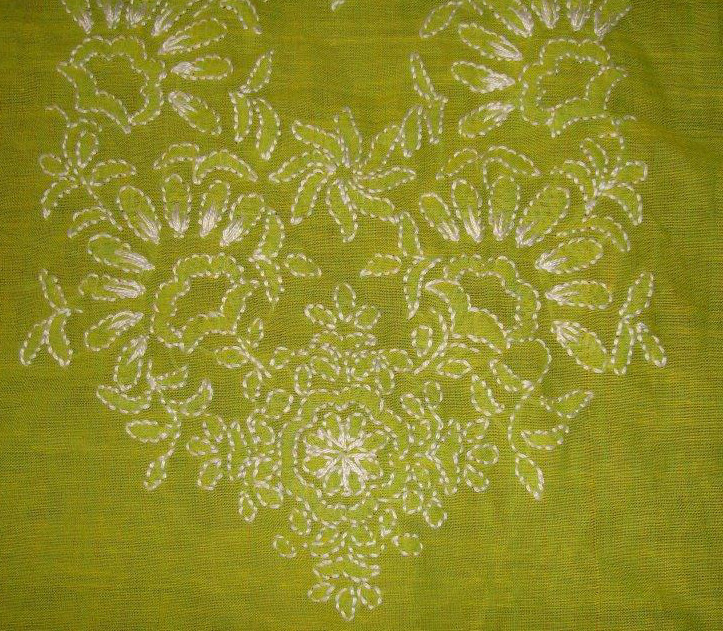 Simple kantha designs are being screened now. 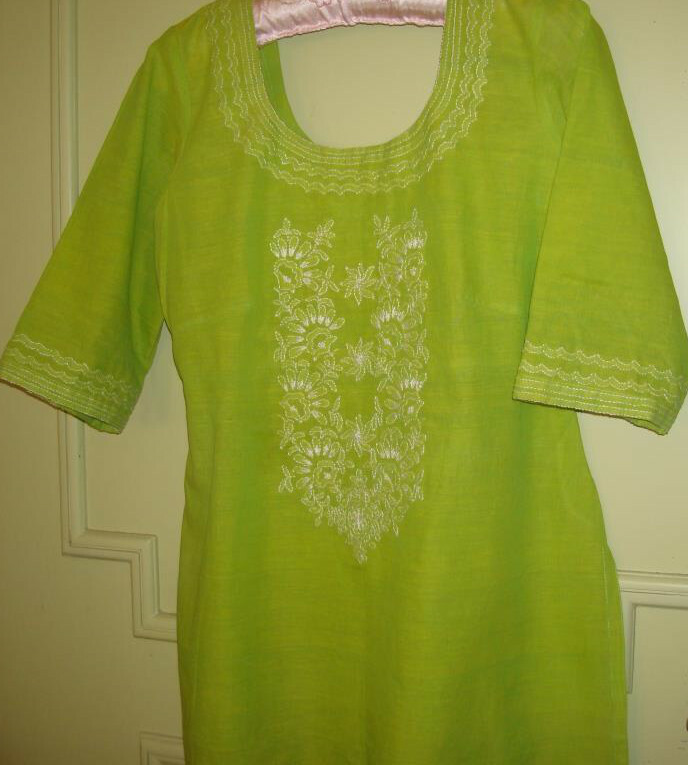 This is the second tunic with lemon green and white combination. 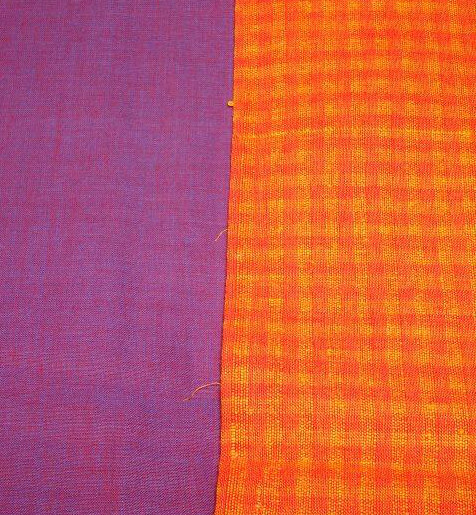 This summer these two colours were predominant in the tunic embroidery projects. 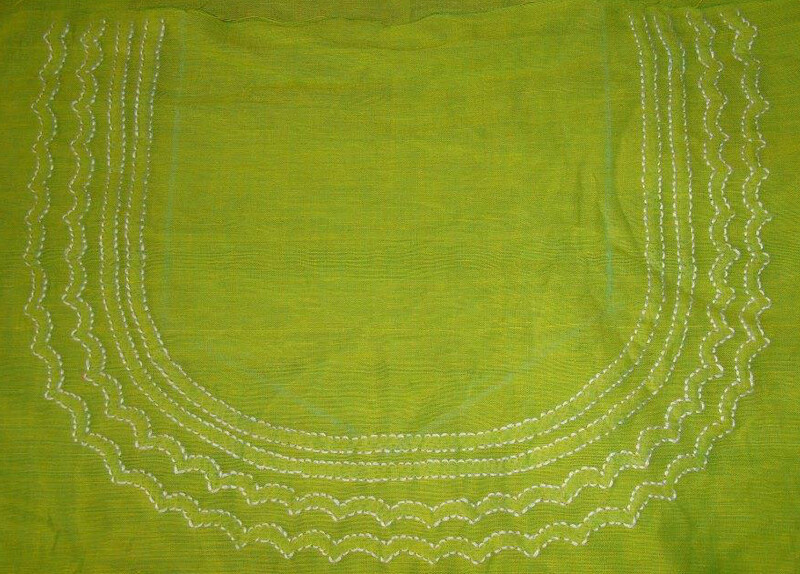 The fabric is handloom cotton and the embroidery was done with white cotton skein and some details worked in white perle cotton #8. There are two design elements. 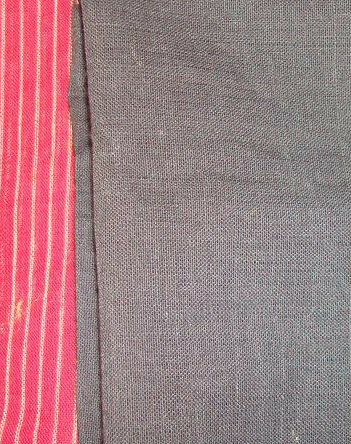 The first element is borders which were worked on the sleeves. The same border design was worked around the neck. These designs were drawn by hand with a foot ruler. 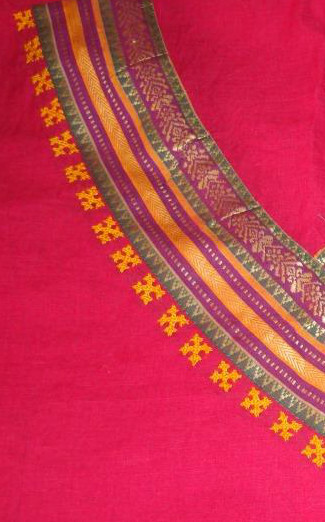 The pattern was drawn on the wrong side of the cloth and embroidery was also worked on the wrong side. The fabric being see-through, was placed on the pattern and the floral design was traced with a pencil. Started the embroidery in the centre. The work in progress of the floral design. The shadow work/ chikan work/ closed herringbone was worked with four strands of cotton skein. I felt the thickness of the thread will make the embroidery more prominent. 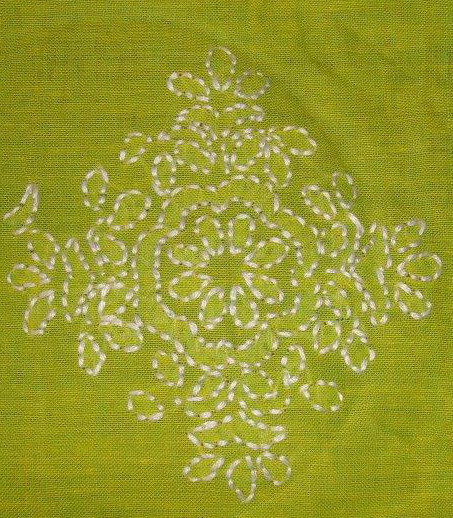 After working the herringbone stitches in cotton skein, white perle cotton# 8 was used to work the straight stitches inside the petals. These straight stitches were worked on the right side of the fabric. 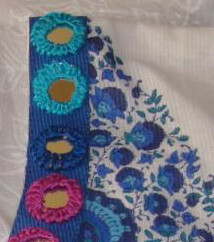 The last detail of French knots worked on the flowers. This tunic does not have lining. If required a slip can be used. I have one in this green. Sometimes it is hard to get lining fabric in cotton in this place. Since a polyester fabric will take away the comfort factor, it is better to go without a lining.